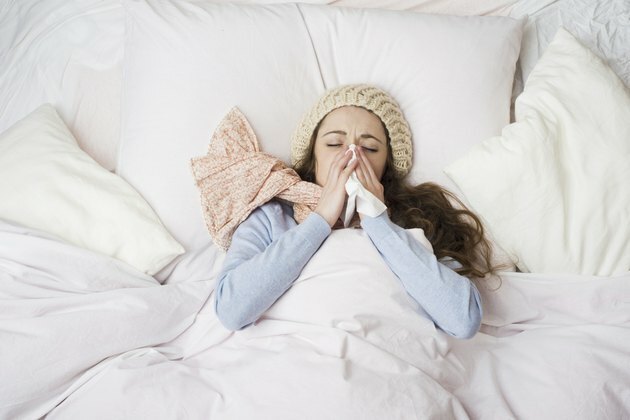 Few people enjoy being sick, whether the illness results from contact with an external harmful agent such as a pathogen or an internal condition such as cancer. Illness not only weakens your body in many cases, but it also often interferes with your immune system, making it less able to protect you from other dangerous substances and conditions until you recover. Regaining your strength after illness -- and maintaining good health -- depends on your ability to eat properly, exercise sufficiently and manage stress. Illness takes a toll on both your immune system, which fights to help you recover, and your body. Eating properly after you get better supplies the calories your body needs to replenish its energy stores. A balanced diet also contains the nutrients and antioxidants your body and immune system require to function well. For instance, minerals and vitamins with antioxidants help remove unhealthy substances, called free radicals or oxidants, from your blood. A healthy diet for a person recovering from illness should include foods high in fiber, such as whole grains, and minimal saturated fat from foods such as red meat, whole dairy products and certain cooking oils such as coconut oil. Plenty of fruit, vegetables and water keep your body hydrated and supplied with adequate essential nutrients. People who engage in regular exercise tend to have stronger joints, muscles and organs, such as the heart and lungs. In contrast, people who exercise too little -- due to illness, for example -- usually develop weaker joints, muscles and organs over time. Exercising after you beat an illness helps your body regain strength by forcing your joints, muscles and organs to resume a higher level of activity. Benefits besides increased strength that improves your health and sense of well-being include lower blood pressure, greater amounts of oxygen circulating throughout your bloodstream and increased levels of mood-enhancing compounds called endorphins. Stress affects sick people in numerous ways, including weakening the immune system, which increases your chances of becoming sick. Stress can increase your anxiety during illness as well, and prevent a quick or average recovery afterward. Taking steps to manage the stress in your life will improve your mental health and give you the focus and desire to take steps that strengthen your body. The ability to avoid and manage stress also allows you to avoid stress in the future and stay calm when stressful events are unavoidable. Strategies for lowering stress levels include engaging in calming activities such as walks or pleasant hobbies, and learning how to breathe properly through activities such as yoga. Other avenues to improve your strength following illness require changing habits that threaten your health, whether you are sick or not. For instance, using tobacco products such as cigarettes and drinking alcohol excessively can increase your risk of getting sick and hamper your ability to get well after an illness. To remain healthy, avoid such substances. Maintaining a normal weight also helps. If illness causes you to gain or lose weight, consult a health professional for tips to lose or regain pounds safely. Why Is Personal Hygiene So Important?